Her name was Mafuza Begam. She was born and brought up in a Muslim family. She was very devoted to Allah and kept all religious activities seriously. She used to pray five times a day at home and tried not to miss any Islamic assembly nearby. She always used a vail if she needed to go outside her home. She became very surprised and upset when she saw a Bible on the bed of her husband, Doc. Samsuddin. She recognized that it was a Christian religious book and asked her husband why he bought this book. Her husband actually hid his new faith in Christianity from his wife because of fear of facing persecution. Doc. Samsuddin had become a Christian in 2008 and he told Mafuza that he liked reading this book since there are many stories written about Islamic prophets. 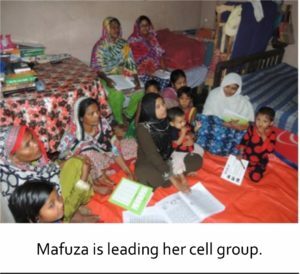 Mafuza watched that her husband was serious reading the Bible regularly. One day her husband took his son to attend a Christian seminar and his son received Jesus as his personal savior there. They were scolded by Mafuza when they returned home. She even beat her husband. Her husband requested that she read the holy book and find if there are any harmful words written in it. Mafuza was not interested in reading the Bible. Doc. Samsuddin and his son attended Christian seminars often and that made Mafuza interested to know why and where they go. One day her husband requested her to attend a Christian Couples seminar. She went with her husband to find out what happened there. The Lord softened her heart there and she attended all the classes. She came back home and started reading the Bible. One day our lay pastor, Baror Ali, visited her house. He asked if she wanted to receive Jesus or not. Mafuza replied very positively. Then, Babor Ali led her in a prayer of faith and she gave a public testimony of baptism in a pond nearby. Now she is very regular in reading the Bible. She has three cell groups: one is at her house and two are at other places. 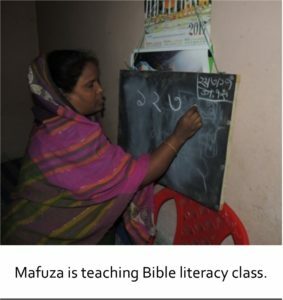 She uses Bible literacy materials to teach them how to read, write, and share gospel stories to them. She has already planted three cell churches and made two disciples. Please pray that she can continue to win souls and plant more church this year. Thank you for your comment. If you would like to send a card or letter to the missionary, you can send it to our office at PO Box 771139, Wichita, KS 67277 and we will make sure to forward it on. You can also email us at efm@friendsmission.com with any questions. Let us know if there is anything else that we can help you with. just have a shortage of staff to handle this??? Thank you for your feedback. If you click on “Read more…” at the bottom of the page, you will find the complete prayer letter that has requests and praises sent to us by all missionaries on the fields. Please let us know if you have an other questions.